Frosted sugar cookies are a staple on almost everyone's Christmas baking list. I've made them lots of different ways over the years but my favorite recipe is this one. These cookies bake up without changing shape so its easy to see the details from the cookie cutter. They stay fresh for quite a while and don't turn rock hard as long as you keep them in an airtight container. The almond and vanilla extracts give them great flavor without being too sweet. 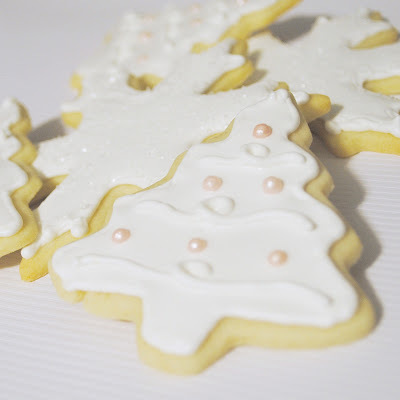 Royal icing is necessary if you want cookies that you can decorate in layers and it dries hard so you can stack the finished cookies without ruining them. Royal icing requires a little practice but it's pretty quick and easy once you get the hang of it. The recipe below will give you the right consistency to outline your cookies. I generally use a piping bag and a Wilton tip #2 or #3 to outline my cookies. Once you've outlined the cookies, thin the icing by adding a little bit of water (a teaspoon or less) at a time until it reaches the consistency of a thick syrup. In my opinion, the easiest way to fill in the cookies is to fill a squeeze bottle with the thinned icing and flood the cookies, using a toothpick to pop any air bubbles and spread icing out to the outline. You'll want to let the outlines dry for about an hour minimum before you fill them in. Then let the thinned icing dry overnight before stacking the cookies and packaging. Cream butter in a large mixing bowl on medium high speed, about two minutes. Add powdered sugar and beat until well incorporated. Add in egg, almond and vanilla extracts, and salt and mix until well incorporated. Add in flour and beat on low speed just until mixed. Transfer dough to a large sheet of plastic wrap, form into a disc and wrap well. Refrigerate dough for at least one hour. Preheat oven to 350 degrees. Line cookie sheets with parchment paper or silpats. Flour counter to roll out cookies. Also flour rolling pin. Roll to approximately 1/4" thick and cut with cookie cutters as desired. Transfer cookies to prepared pans and bake about 8 - 10 minutes. Cookies should not brown. Gather scraps and re-roll. If dough becomes sticky, return to refrigerator briefly before rolling. Recipe yields about 4 dozen cookies depending on size of cookie cutters. Combine water and meringue powder in mixing bowl. You can make royal icing without a stand mixer but its a lot easier with one, your arm will get tired with a hand mixer! Beat until slightly foamy. Add powdered sugar, corn syrup and extract, beat on low speed until combined. Increase speed to medium high and beat about five minutes until stiff peaks form and icing is glossy. Divide icing into small containers to color. Add gel coloring as desired and press a piece of plastic wrap directly against the surface of the icing and cover with a lid. To do the shimmery snowflakes, I added sanding sugar over the thinned icing after letting the cookies stand about five minutes. For the Christmas trees, I let the flood icing dry completely before piping on the swirl lines with the original outline icing. If you leave the outline icing in the piping bag, make sure you cover it with a damp towel to keep it from drying out. This recipe should be enough for the above cookie recipe unless you need to use lots of colors/layers of icing. These look so beautiful! 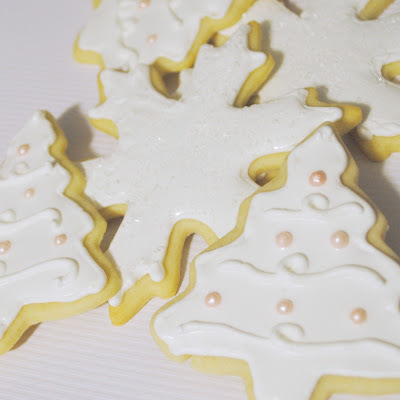 I've never thought to do Christmas trees in all white, but these are too gorgeous not to try! Tried this recipe. And I honestly just was not impressed. Sugar Cookies are my favorite! But, this recipe just was not sweet enough for me. They look really cute when decorated but that's the only positive thing about this recipe! Even my family agreed they are not Sweet enough! Would NOT recommend this recipe.